An autumn trip to the Azores has become something of an annual pilgrimage for me since my first visit back in 'fall' 2011. Despite the fortnight being dominated by high pressure and easterlies that October, I still managed to see Blue-winged and Tennessee Warblers, Purple Martin, Cliff Swallow, Wood Duck and Common Nighthawk among a host of Nearctic species. I also had my first taste of finding an American landbird in the Western Palearctic — OK, 'only' a Red-eyed Vireo, but an exhilarating moment nonetheless. The taste was sweet, and I left wanting more. I returned to Corvo in 2012; we enjoyed two weeks of westerly-dominated weather and consequently a memorable period that is widely regarded as the most productive since Peter Alfrey's mouth-watering experience in late October 2005. Again I found Red-eyed Vireo, but was finally rewarded handsomely for my daily efforts in the form of a smart Northern Parula. 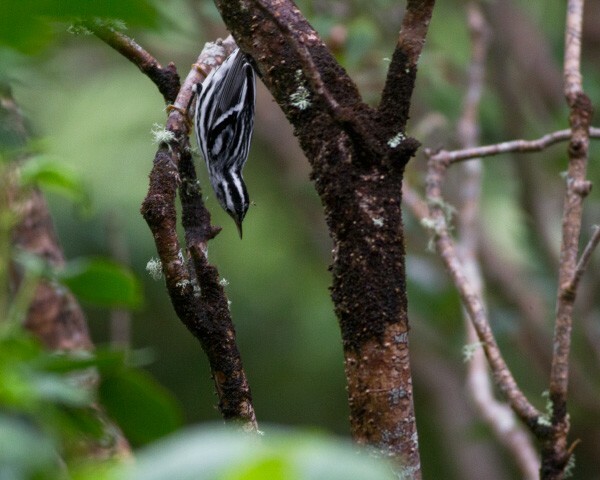 Black-and-white Warbler, Corvo, 9 October 2013 (Photo: Josh Jones). Yet somehow I felt frustrated. Given that I'd seen some great birds, such a mindset no doubt sounds blasé, perhaps even ungrateful. Each day, I'd been alternating between the woods and the fields, climbing up valleys, and fighting through dense patches of brambles and hydrangea hedges — and the changeable weather had ensured that I'd ended up soaked at least once a day. Yet, despite the effort, the toil, the sacrifice...I hadn't found anything. And that was what, more than anything, I was there to do. I craved my own adrenaline-fuelled discovery. Without intending to sound selfish, it is a difficult pill to swallow when others are finding great birds around you and you can't seem to find your own; you start to question your ability and effectiveness as a bird-finder, or whether the strategy you've adopted is the correct one. I overslept slightly on Saturday 12th, thus missing the early taxi up the sheltered valleys on the east side of the island. Just as I was tying my bootlaces in front of the guesthouse, the radio crackled to life — Devon birder Phil Abbott had flushed a yellowish, bunting-type bird from near the rubbish dump that had landed in the middle fields, just a few hundred yards from where I was sitting. It seemed rude not to go and help the search and so, joined by Pierre-André Crochet and Vincent Legrand, we headed up to the fields. Just minutes later and Pierre was chattering excitedly — we'd split up to search the fields and, with a fabulous stroke of luck, a Cedar Waxwing had simply dropped out of the skies and perched in the bush next to him! The waxwing was absolutely brilliant and really lifted us, but it was all the more galling knowing that I'd been a matter of metres from finding it myself. 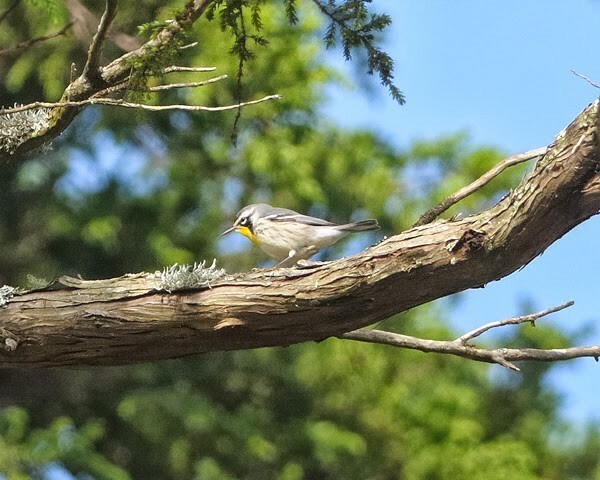 As it turned out, Phil's mystery yellow bird was a Bobolink, relocated a stone's throw from the waxwing (we learned later that day that there was not one, but three, knocking about the village). It was very clear that the promising winds of Thursday and Friday had begun to deliver birds and, with new-found optimism, I hopped in the taxi up to the ribeiras. 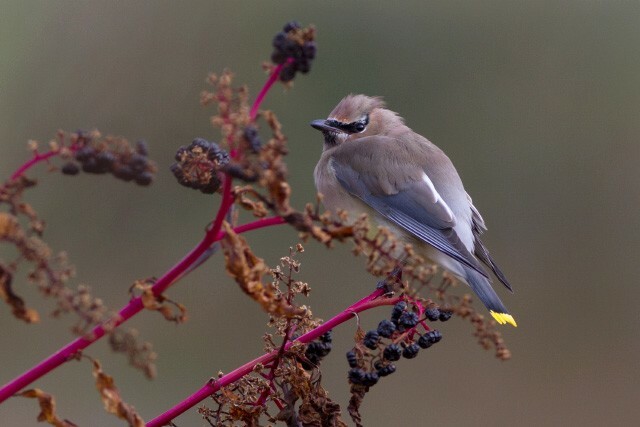 Cedar Waxwing, Corvo, 12 October 2013 (Photo: Josh Jones). My chosen destination was Ribeira de Poço d'Agua: the upper parts of this valley are characterized by open hydrangea hedges, brambles and patches of laurel bushes, and it felt like a day to be exploring the more open areas rather than the often suffocating woods. I started upwards with no success, reaching the fantastic area of juniper scrub that dominates the steep upper slopes. Escaping a passing shower, I sheltered behind a stone wall below the junipers as I had my lunch. Surely I couldn't go another day without scoring? With the sun soon out again, I jumped up, scaled the wall and in the process saw a passerine with gleaming white underparts zip between two nearby junipers. It was a fleeting glimpse from the corner of my eye, but I'd scrutinized enough Blackcaps over the previous days to know it was something different. My guess was that it was a vireo — a hunch soon confirmed as a smart Red-eyed sat up in the bushes 50 metres in front of me a few minutes later. At last, the duck was broken! Red-eyed Vireo, Corvo, 12 October 2013 (Photo: Josh Jones). 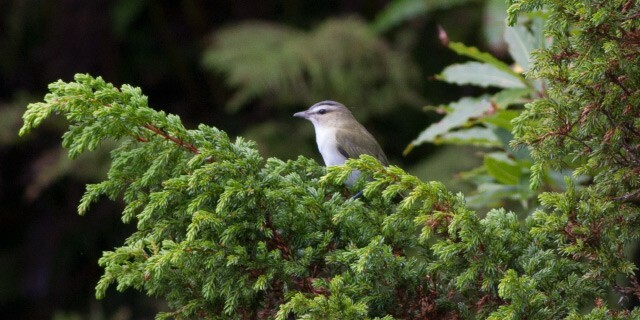 I spent another half-hour with the vireo before deciding to move on. Being very restless and mobile, it showed all the signs of being a freshly arrived bird, and as a result I didn't manage more than a few record shots before it disappeared. Buoyed by success and having learnt that a Common Yellowthroat had been found in the village, I worked hard for the rest of the day but saw little else — but at least I wouldn't be heading home empty-handed. On the Sunday a storm arrived, bringing with it winds of over 50mph and plenty of rain. As a result, most birders ventured outside only for a wander round the fields. It was a day to recharge the batteries and, with the forecast looking really rather good again from Monday night onwards, a rest was definitely in order. That said, a Mourning Dove gave many people the run-around the village before eventually giving itself up in the evening. In complete contrast, Monday was as calm as you like. The first new bird came early, as the radio relayed news of a Common Buzzard over Ribeira do Vinte. This would be an unprecedented record for Corvo and so I attempted to locate it from the lower part of Poço d'Agua. A few minutes later, and there it was. My views were distant and brief, but it was clearly no Common: the long wings and almost black underparts suggested something Nearctic — the Azores' first dark-morph Rough-legged Hawk, no less, and I radioed out the re-identification. More on that bird, in another article, anon. Further new birds found during the day included a delightfully showy Philadelphia Vireo discovered by Graeme Joynt in the lower parts of Ribeira da Lapa, and a couple of Red-eyed Vireos. Later in the afternoon, the Black-throated Blue Warbler was also refound in Ribeira do Cantinho — though I (and a few others) at the opposite end of the island failed to pick up on the news until it was too late. 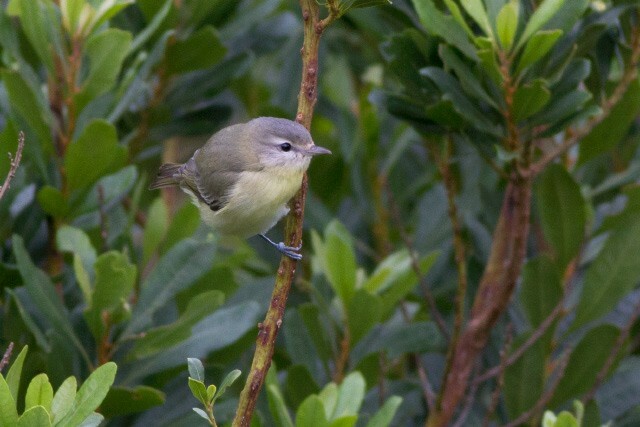 Philadelphia Vireo, Corvo, 14 October 2013 (Photo: Josh Jones). As a result, my Tuesday was largely dedicated to the Black-throated Blue, which eventually gave mind-boggling views as it hopped about on the ground at the bottom of the valley. That said, some independent searching during the afternoon once again failed to be rewarded by a find, though optimism remained high as the Polish team pulled out an American Robin on the caldeira slopes late on — only the second for Corvo and the Azores! Wednesday 16th came, and the realization that I had only two full days left on Corvo made me more determined than ever to find something good. In the taxi on the way up to the ribeiras, we received news that the Poles had glimpsed a Yellow-rumped Warbler in the area where they'd seen the robin the previous evening, so I headed up to help the search for those who 'needed' it. It was soon clear that the bird wasn't around, so I formulated a plan for the day. Given that I was so close, it made sense to visit my favoured area at the top of Poço d'Agua first, before working my way down the valley and finishing in the extensive woods of Fojo. Leaving the road and dropping down into the valley, I focused. The sun was out, the area was sheltered and there was plenty of bird activity: Blackbirds, Chaffinches and Grey Wagtails were ever-prominent, and the local Blackcaps responded well to pishing. It felt like a vireo might pop out of the laurels at any moment. For the next hour I concentrated hard, slowly working my way down the juniper slope — stopping, listening, or simply waiting for something to show. But it didn't come. Sighing, I set down my bag, turning away from the main valley and strolling over to check the final few junipers for any signs of life. It was at this moment, perspiration forming on my brow as I squinted ahead, that the birding gods smiled down upon me and blessed me with the shot of immense fortune that I'd been coveting for the past ten days. Three birds were moving between the junipers in front of me. Two were easily dismissible as Blackcaps with the naked eye, but the third caught my attention as it flitted. I lifted my bins to see a heavily obscured bird, but I could make out two white wingbars. My heart leapt — I knew instantly that I had a Nearctic wood-warbler, but which one? The greyish back immediately had me thinking of Myrtle, particularly with the species so fresh in my mind after the Poles' earlier find. But the way it was creeping around didn't fit, and reminded me much more of Black-and-white Warbler. The bird was extremely obscured, but I could make out some flank streaking. And then, bang — it raised its glorious head from behind a bunch of juniper berries. A shock of yellow leapt out at me, as did an unmistakeable black-and-white face pattern. It was like a massive slap in the face. I'd spent more than enough time poring over my Sibley guide to know exactly what I was looking at — "YELLOW-THROATED WARBLER!" I shrieked disbelievingly. 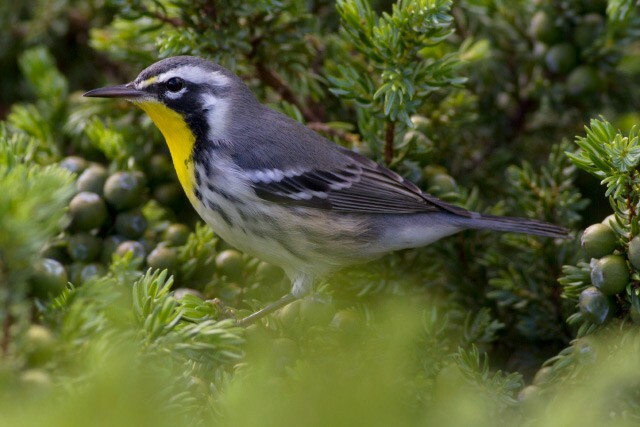 "It's a [expletive] Yellow-throated Warbler!" This all happened in a matter of a few seconds. The identification wasn't a gradual process, built up over several minutes of observation before the bird eventually gave itself up. It was almost instantaneous — and for that reason, the magnitude of what had just revealed itself on the nearside of a juniper bush less than ten metres away from me seemed all the more incredible. Dropping my bins, I fumbled for my walkie-talkie, eyes fixated on the movement in the bush in front of me. Aware that I was in a valley and radio signal might not be at its best, I started uttering "Yellow-throated Warbler" on repeat until a response was solicited. "Can you repeat the species?" came a reply. Confusion had arisen from the earlier report of Yellow-rumped Warbler nearby. 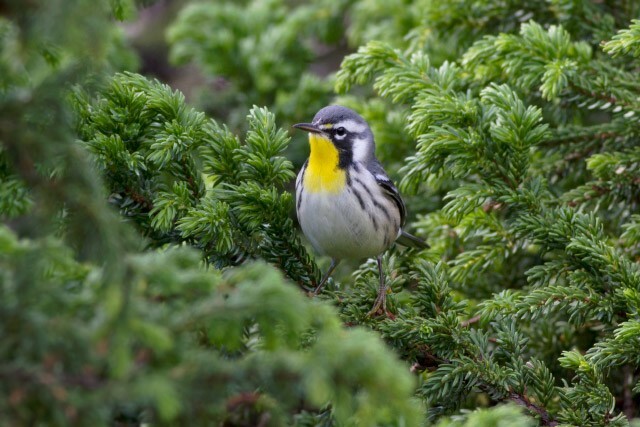 "Yellow-throated Warbler," I urged. "First for the Western Palearctic." Those final words seemed to do the trick, as the first breathless birders arrived to join me within quarter of an hour. But, despite their quick arrival, the bird had disappeared. I had run back to fetch my camera only to return to the bushes to find it gone. I doubt there's a worse feeling in birding than having just seen a regional first so well but failed to obtain any sort of photographic proof of its existence. Arriving birders looked exhausted, bemused.... I suggested a plan of attack but, happily, that wasn't necessary. Michael Fricke relocated the bird 100 metres up the valley, again in junipers. Excitement levels hit fever pitch as a running commentary was given on the bird's every move. The photographers moved to the frontline; countless shots per second really did sound like a barrage of automatic weapon fire. More importantly, though, I could breathe a sigh of relief: the record was now multi-observed, and well documented. Handshakes, hugs and smiling faces in the warm October sunshine really summed up what's to love about Corvo at this season: fantastic vagrants, beautiful scenery and a great community spirit. All I managed to do was collapse on the ground in a heap of satisfaction as events unfolded around me. Yellow-throated Warbler, Corvo, 16 October 2013 (Photo: Darryl Spittle/Gwent Birding). The bird quickly disappeared again within minutes, and half a dozen latecomers failed to connect with the bird that day. As a result, Hanno Palojärvi's beautiful White-throated Sparrow found just a few hundred metres away — a first for the Azores, no less — was not as happily received as it perhaps should have been. With no further sign of the warbler by the end of the day, it was a tense evening back in the village: great joy and happiness that many of us had seen a first for the WP on Corvo, but equal sympathy for those who had not connected. Happily, though, the bird was refound in the same place the following morning. This time, it really gave itself up as it performed at just a few metres' range in warm and sunny conditions. The photographers were able to fill their boots as those who missed it the previous day were rewarded with some crippling views. Finally, I could relax knowing that everyone on the island had connected. After spending nearly five weeks on Corvo spread over three years, I'd finally registered the find I'd been searching for, a bird that would be remembered by all. It had taken over 24 hours for the feeling of satisfaction to sink in, but it had all been worth it. And what a bird, as well: Nearctic wood-warblers are all pretty smart, but this bird's combination of slate grey, black, white and yellow was hard to beat. As one or two people have said to me, I might as well hang up my bins now as it's unlikely to get any better! 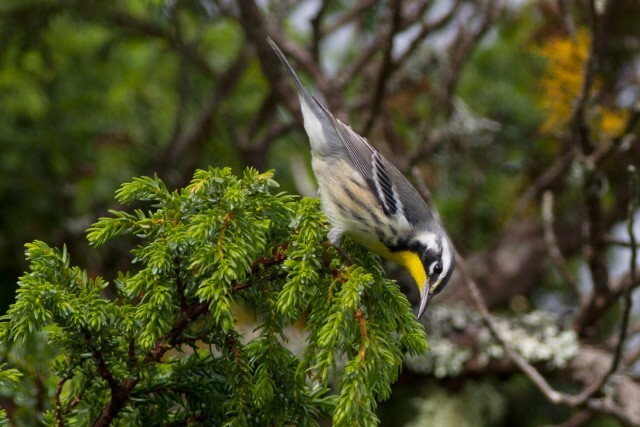 Studies of the Yellow-throated Warbler, 17 October 2013 (Photos: Josh Jones). I tried a few more areas for the rest of the afternoon, but my concentration wasn't quite there. It's never a good thing to switch off on Corvo, but it was hard to get back into the zone after the warbler. I managed to refind the Common Yellowthroat in the village before my flight back to São Miguel the following day, but little more despite westerlies. 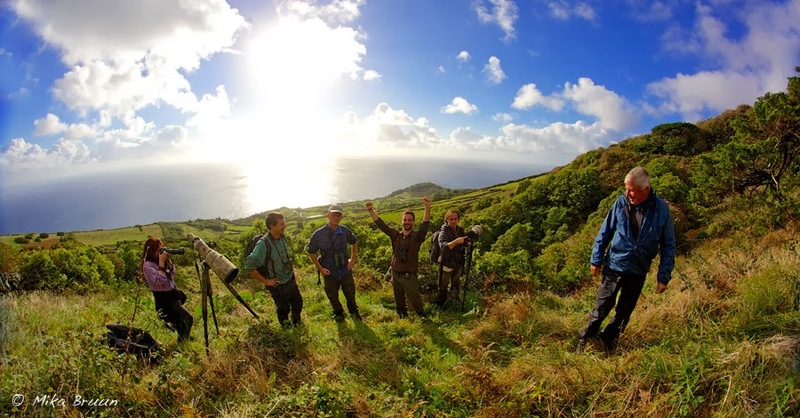 The finder (third from right) celebrates all birders on the island connecting on the bird's second morning (Photo: Mika Bruun/Tarsiger). And with that, my third October on Corvo came to an end — 2013 has once again seen the island prove itself as one of the world's honeypots for finding vagrant birds, producing yet more fantastic records during the peak autumn weeks. It was particularly nice to have been heavily involved in contributing to this year's records — which, incidentally, continue to occur: on Sunday, a Gambell's White-crowned Sparrow was discovered in the village, the first Western Palearctic record of this western form! With birds like the sparrow and the warbler occurring on the island, the sky really is the limit out in the mid-Atlantic. A quick flick through Sibley reveals perhaps 30 or more anticipated vagrants from the States yet to be discovered in the Western Palearctic — and that's discounting the real surprises that will no doubt occur from time to time. Bring on 2014.